If you like me like to read city plans, here's one for Stockholm. BBC clip from Astana, Kazakhstan's 21st-century capital. Now I've moved district from Chaoyang to Tongzhou in Beijing province, so this is a good excuse to play this talk, Learning from... Tongzhou, comparing Tongzhou with the Dutch planned town of Almere (which has a somewhat comparable role to Amsterdam). In summary, less central planning tends to be better except for some infrastructure stuff? Pretty much. I basically agree, mind you, but she didn't put much substance behind it except, "I like that" or "I don't like that", which was somewhat disappointing. However it did show some differences between Northern Chinese and European cities, though it was an interesting role reversal to pick a European case for the planned city. All Chinese cities are planned, even when receiving huge organic growth. The land law exacerbates this. It is more complicated than this, but two main models are smallholder property and leased land. The former tend to be rural and the latter urban (an important distinction in China). Smallholder land has less legal protection than leased land. In principle you could build your own house there, but in practice it is the village that does it, and they tend to go for a readymade model, usually one or a couple templates, it gives more money to the village. Leased land is leased for (now usually) 50 years for commercial or commercial-residential lots and 70 years for residential, and are auctioned off by the city to the bidding developers. Each developer build the houses in their style, same for all houses in the lot, except for a few developers, bless'em, that design variety, planned variety. It's all very Sim City. I am living, on leased land, on the other side of the street of a city block which fairly recently was a village, with a lively village market, surrounded by store fronts and 8-10 lane streets. The interesting thing is what happens next, which is kind of the gist of her talk. In Europe planned cities remain planned, for a while anyway, less so in Chinese cities depending on how "European" they are, so to speak. Hong Kong has a strong 'stick with the plan' culture, Singapore more so, Shanghai considerably less but way more than most Chinese cities, including Beijing, which still, being the capital, is under more supervision than other Chinese cities, especially inland cities, where people do, and can get away, with most anything. There's no civilized life in cities. Polis aren't what it used to be, small villages by the countryside are the best option for those who cares about civilization. What makes a city planned? Doesn't for example a medieval city wall pretty strictly delimit the area where one can put one's house? In modern cities we have the infrastructure (water and sewage pipes, electricity cables, etc.) without which I don't even consider the place a city, and the infrastructure inevitably requires central planning and administration. So, what is an unplanned city? Is it a slum? A refugee camp? Planned city. You build a city after a plan, in previously unused or disused land (sometimes after kicking out those that used it before), so that the initial number of citizen is 0. Most cities grow organically, a village or town that grows in number and size, swallowing up other villages or towns as it grows. Most people have a dim view of planned cities, including me and I suspect you. They lack the variety and flexibility that more organically grown cities have. Of course urbanisation is always the result of human planning, including slums and refugee camps, but an overarching master plan may be lacking. Of course cities first start living when people move in and make them theirs, and that's usually where the plans end. Cities (mega cities) are destroying man's soul. Destroy the cities and liberate yourself. Humans aren't insects for living in mega colonies of millions. You are so right there on cities. Here back in the 1950's it was thought that my city was overcrowded and indeed it was. A massive housing plan went into operation which moved many elsewhere in Scotland as well as some inside the city boundary. Back then the population was around 1,089,000 but now is just over 500,000. Interestingly at the same time we were always the British city with more park space than many other cities in the country. Science films that have hundreds of thousands living in massive skyscrapers can be passingly amusing but in places there is some of that going on. Every time green sites fall is sad and putting a blight on the future. Yes, Glasgow is a bit like a Scottish Detroit. How elementary a comment jax and you thought you were bright. Here in Gt Britain unlike the US of A a city could not become a Detroit and fine you well know it. We do not have as a passing fact (should tell you this due to being so would-be funnily stupid) street after street, neighbourhood after each other lying deserted, the fire brigade constantly out putting out fires (Detroit has the US record) nor legions of homeless due to the City council building public housing at reasonable rents. Nor do we have over 200,000 people with no water for drinking, washing or sewage. Our city also seen the sense of more green space even though Glasgow has more park space than any other city here. So for all your daft attempt at satire alongside that last also idiotic follow up is a bit pointless. Things like detroit in the modern advanced countries can only happen in the land of freedom. Starve them, throw them out ot leave them waterless like a Third World State. Glasgow has hosted the Garden City thing and was also picked to be the place for the outstanding British Commonwealth Games so I can smile of course. Mind you there is a reason. The bulk of the Detroit population are back so in America that is you out of the window and a more important point than a poor attempt at sniping at a modern and friendly city. That point is made even more obvious by the numbers of whites who did white flight and even the decent couldn't do much and knew it. Neat how you both hadn't the grey cells to know that. So I did. Oh well. Cities are organisms that don't take well to slimming. Growth is a challenge, but decline is a much greater one. In the case of Glasgow it is primarily an administrative one, not a structural one, like it is with Detroit. Speaking of "humane, resilient and joyful cities" like Detroit and Glasgow, Is Jan Gehl winning his battle to make our cities liveable? What makes your city liveable? Jan Gehl had just graduated as an architect; it was 1960 and he had been schooled in how to "do modern cities, with high-rises and a lot of lawns and good open space - good windy spaces". About to put those years of study into practice, he met his future wife, psychologist Ingrid Mundt, and everything changed. In the years that followed, he would develop the thinking that has made him a pioneer of so-called "liveable cities" around the world. Meeting Ingrid, someone who had studied "people rather than bricks", says Gehl over the phone from Copenhagen, catalysed a host of discussions between young architects and young psychologists questioning why architects were not really interested in people, how architecture can "influence people's lives", and "how cities are used by people". Ultimately the idea was to think up ways to make cities "that people would be happier using". Typically, says the 78-year-old - not long off a plane from Japan but sounding sharp - "the main focus [of urban planning] has been to keep the cars happy". But Gehl, bolstered by psychological thinking, spent the next 40 years developing principles based on how the shape of cities can impact on the human lives lived within them, rather than on traffic efficiency and parking spaces. I don't know how much impact this particular guy has, but I sure hope so. Here in Gt Britain unlike the US of A a city could not become a Detroit and fine you well know it. "If things carry on as they are now," says Alex Niven, a leftwing writer from Northumberland, "in five years the situation will get somewhere like Detroit." Several other authorities in the north-east that I interviewed invoked the long-imploding American city, unprompted. He left the area 10 years ago, aged 18, and now lives in London. "Almost all my friends from school live in London now. When you go back to the north-east, the landscape's kind of crumbling. There is this sort of sadness. It feels like a people who've been weakened, who've just been cut loose." You have well missed the point there jimbro. I wouldn't want to live in posh Edinburgh even though it looks 2nice." There is no comparison between that town being the least one to visit and places going bankrupt. Neithr is the town decrepit it is an atmosphere thing. That you cleared out the place you were brogue up is noted. You totally went distant and it does not contradict what i said that a Detroit could only happen in the USA unfortunately not here in GB. That English town is not a dump like Detroit has become so sadly for a modern country and that such things happen is a head shaker. Cities worldwide are expected to replace 50 million aging fixtures with LEDs over the next three years, with roughly half of those in Europe. Some are mainly interested in switching from outmoded technologies to one that uses less energy and can last for decades. But many others want to take full advantage of the LED's electronics, which are more conducive to wireless communication than other types of lighting. Los Angeles, for example, has almost completed the switch to outdoor LED lighting and is using sensors embedded in the pavement to detect traffic congestion and synchronize signals. It often seems like federal-level politicians care more about creating gridlock than solving the world's problems. So who's actually getting bold things done? City mayors. So, political theorist Benjamin Barber suggests: Let's give them more control over global policy. Barber shows how these "urban homeboys" are solving pressing problems on their own turf -- and maybe in the world. They might be already, Cities as Economic Units Rather than Countries. 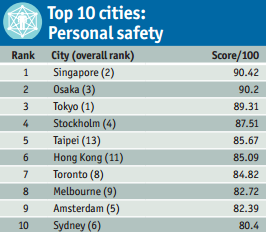 Stockholm, the satellite capital to my new hometown Södertälje, is "the only non-Asian city in the top 5 for personal safety" [of the cities included], according to Safe Cities Index. Um, what? Amsterdam is the unsafest municipality in the Netherlands in terms of theft, burglary, violence and wanton destruction per capita (source). Nor do Rome and Brussels perform well. This is a competition between a select number of cities, 50 "global" cities, 13 cities in Europe (Stockholm most safe/Moscow least safe), 7 in North America except Mexico (Toronto/Washington DC), 6 in Latin America (Santiago/Mexico city), 6 in Middle East and Africa (Abu Dhabi/Tehran), 18 in Asia-Pacific (Tokyo/Jakarta). This seems to be the first time around, the sample is likely to be bigger in the future. I didn't see the weights, but I would assume most people place more value in personal safety and health over digital and infrastructure security. I think those idiots of Isis instead of shooting a gazette no ones knows should shoot instead The Economist. That would be a benefit for the civilized world. Page created in 0.098 seconds with 48 queries.